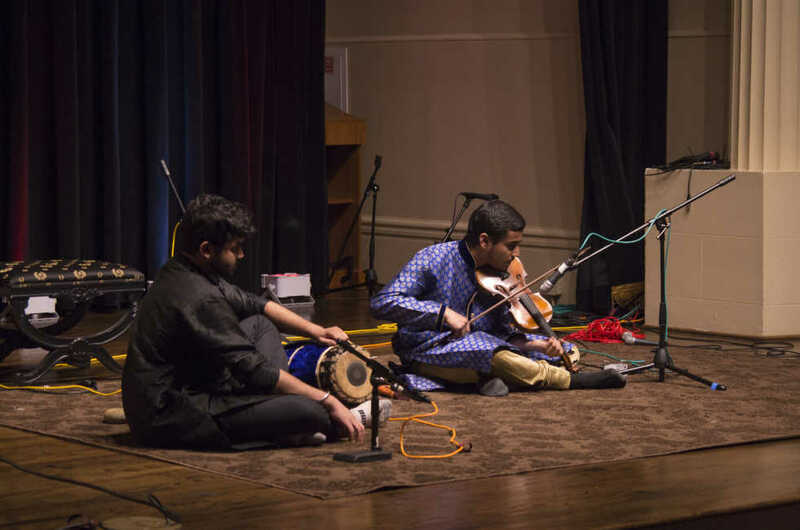 Since 2013, Tech students have been featured in Khayaal, a platform for South Asian classical music, which includes Carnatic and Hindustani music. Carnatic music is a faster-paced genre from southern India while Hindustani is slower and comes from northern India with Persian and Mughal influences. The first Carnatic and second performance of the night featured violinist Aditya Krishnan, whose skill on the Carnatic violin was impressive. Accompanied by Prahalad Ram on the mridangam, a two-sided drum, Krishnan delivered a flurry of notes, resonating in the audience. The second featured performer and fifth overall, Anjana Nagaraja, had a pleasant voice. She performed Carnatic vocals in four different songs in her set. Though placed after a refreshing chai intermission, her set lasted a considerable amount of time. Krishnan, the talented violinist, returned for the sixth overall performance accompanying Carnatic vocalist Vunya Srinivasa. In harmony instead of the lead this time, the violin perfectly tracked the vocalization, adding another dimension to the performance. On the other hand, the Hindustani performances were slower — by a large margin. The main melody is repeated to form a song with small variations each time. The idea is to explore what is possible by slightly deviating from the melody in each iteration. However, to the untrained or unfamiliar ear, it does sound like the exact same melody each time. The first Hindustani set, with vocals by Milap Rane, took listeners on an emotional journey. Rane, in addition to seemingly every other musician and vocalist at Khayaal, has trained under the best in the world. However, the journey did not seem to have a destination. Because the melody repeats continually, it was difficult to tell when a song would actually end. There is no sense of progression to those who have not heard the songs previously, a common trend in the Hindustani sets at the event. The longest performance of the night was the second Hindustani set, featuring vocalist Usha Joshi Balakrishnan; her three songs lasted 40 minutes. While the songs are traditionally that length, even she seemed to check her watch 30 minutes in. Many in the audience were restless — or resting. Sitarist Adam Afshar, the third Hindustani act, gave a more lively performance than the previous, a nice reprieve in duration. Hindustani music is a niche within a niche, and the song length is part of the genre. Although the event ran over by 90 minutes, this deviation was expected. It would be myopic to directly criticize the length as someone unfamiliar with the genre because that is part of the genre itself. At the same time, however, the length makes the genre a bit foreboding to those not already accustomed to it. Khayaal organizers surely had to balance these aspects when scheduling the performances. A compromise was the final act, RAS, a Hindustani fusion group. In a departure from the previous Hindustani performances, Anosh Daruwalla played an electric guitar. Along with Rohit Bhat on the tabla (small drums) and Souryadeep Bhattacharyya on the sarod (a 25-string instrument), their two songs were refreshing, Hindustani but with blues and rock influences. It was then ironic that the most widely approachable performance was saved until four hours after the event began. Overall, Khayaal was pleasantly familiar to the families of the performers, though newcomers may be put off by its long duration despite the excellence in music. If the goal for future organizers of Khayaal is to engage a larger audience, they will have to balance tradition with the expectations of the Western crowd.